San Diego Comic Con is almost upon us! Prepare for four days of overstimulation and non-stop entertainment news, from the heart of the pop culture supercollider on the sea. To help us prepare ourselves for the madness, some of the sites that cover movies and pop culture got together to geek out about what we're most excited to see in San Diego. Check out the picks from MTV, Collider, MSN and other top sites... plus our own choices. Josh Wigler at MTV Movies Blog and Splash Page says: "MTV once again rules the roost for me at Comic-Con. I'm dying to make it to the 'Fringe' panel, where we'll hopefully catch a glimpse of the Observer-studded final season. 'Game of Thrones,' too, is high on my list; any and all RW teases would make the trip to San Diego worthwhile for me. Honestly, I'm even excited for 'Walking Dead,' both the obstacle course (yes, there's an obstacle course!) and the panel, where we'll finally get a healthy look at Michonne, The Governor and the prison - three of the most beloved elements of the Robert Kirkman source material. And I'm really hoping to catch the 'Breaking Bad' panel. I've already seen the premiere, and if they show the cold open … holy wow, I want to be in that room while the audience freaks." Katey Rich is the Editor-in-Chief of Cinema Blend, and she and her mighty team of five are excited to be covering Comic Con with more man (and woman) power than ever before. More than anything Katey is excited to catch the panel for Neill Blomkamp's Elysium, because it's something she knows the least about, and therefore has the most potential to be an awesome surprise. ComingSoon.net and SuperHeroHype's Edward Douglas is looking forward to the entire Warner Bros. panel, since we've seen absolutely nothing from Zack Snyder's Man of Steel and very little from Guillermo del Toro's Pacific Rim, two of what should be the coolest movies of next summer. Likewise, the Marvel panel is always hopping and even though they've only been shooting a few weeks on Iron Man 3, they rarely disappoint and I expect them to show some cool stuff from the movie, much like they did with Captain America two years ago. Oh, and we'll finally get confirmation on that May 2014 movie so we can all stop guessing and making stuff up. Also looking forward to talking to lots of filmmakers/actors since interviewing is my schtick at Comic-Con. Kristal Bailey returns to Comic Con for the 7th time and couldn't be more excited! Each year provides new surprises, big news and this looks to be like no exception. She and Brian Rudloff, the amazing duo from Screen Invasion, are most looking forward to the Community panel and the rest of the TV slate coming to SD. With The Walking Dead, Game of Thrones, and True Blood all having major panels, geek TV is going strong. The movie front is shaping up nicely too, with highlights including Iron Man 3, Dredd, and Pacific Rim. This year at SDCC, the io9 team is excited to see that fantasy is pretty much ruling the con. With The Hobbit coming up, and Game of Thrones still going strong, there's no doubt that this is the year of foam swords and armor in San Diego. We're psyched for the original science fiction too — we'll be checking out Guillermo Del Toro's giant monsters in Pacific Rim, getting the latest on the superintelligent computer in Person of Interest, and visiting a post-apocalyptic world with no computers at all with Eric Kripke's new series Revolution. 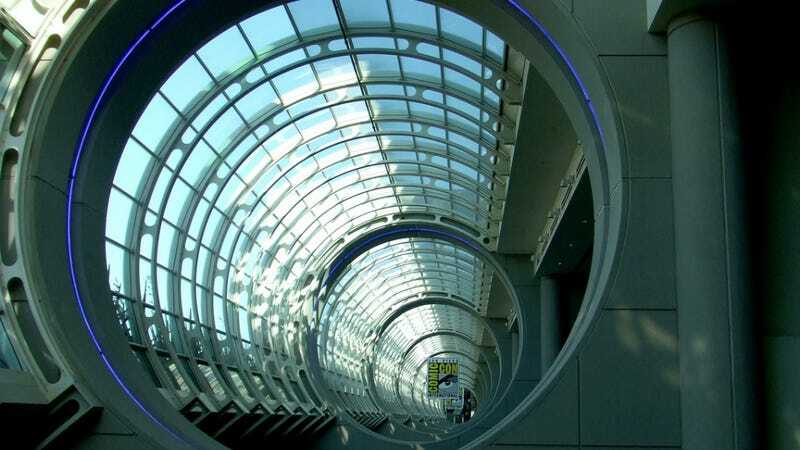 We'll be covering everything from comics and movies, to books and TV, so keep your eyes on io9 at SDCC 2012! Matt Patches at Hollywood.com can't decide if he's more excited for Sony's Elysium panel or Nickelodeon's The Legend of Korra panel. He's been waiting patiently for any look at director Neill Blomkamp's long-awaited District 9 follow-up that's not bald Matt Damon standing around on set, and really, who doesn't want a taste of epic sci-fi at Comic-Con? But going cold turkey on Legend of Korra post-season one finale…well, the panel may be the fix he needs to survive. Don Kaye, lead writer at MSN's Parallel Universe, is split between two things that he wants to see the most: "On the one hand, I am really looking forward to the Warner Bros./Legendary Pictures panel, because I can't wait to get a first look at footage from Guillermo del Toro's Pacific Rim and Zack Snyder's Man of Steel. Both have been shrouded in mystery until now. We're apparently also going to get a peek at Legendary's take on Godzilla. But at the same time, I am super-excited about seeing the Sony presentation on Elysium. I loved District 9 and can't wait to see what Neill Blomkamp has done for his follow-up. If anyone can come up with the big sci-fi movie with big ideas (the one we didn't get this year), it might be him." Alex Billington also returns to cover Comic-Con 2012 at FirstShowing.net. Alex is looking forward to the panels on Saturday the most, specifically Warner Bros' panel for The Hobbit and Zack Snyder's Man of Steel. There's also Quentin Tarantino bringing Django Unchained on Saturday, which should be very fun. He's mostly excited to see how the Hall H crowds react to these presentations, and hear the responses after. Matt Goldberg is going to be at Comic-Con covering Hall H for Collider.com. "I'm jazzed to see Django Unchained and Iron Man 3, but not so much because of the footage since that will all be released in due time. I'm more excited to see Quentin Tarantino and Robert Downey Jr. since big personalities on the Hall H stage always makes for a good time," he says. He adds he's "also eager to see what surprises various presentations may have in store." This year, the Film School Rejects will be hiding in the bathroom stalls so that we can be the first in Hall H to check out everything from Frankenweenie to the Batmobile. We'll be ironically wearing Team Bella t-shirts (except for Brian) as we bring news from Jackie Chan's production company, ParaNorman, Disney, Game of Thrones, Disney's Game of Thrones and the science fiction of Total Recall and Looper. While Fure rubs his own chest to the Expendables 2 footage (and reports back), Brian will be writing about his experiences as a first-timer, and we'll collectively make sure that you, dear reader, feel like you are at the Con yourself. Dressing up like your favorite comic book character is on you though. We can't be held responsible for clothing you. This year the gang at Movies.com is planning to load up their Comic-Con page with as many interviews, panel reports, footage reviews, podcasts, and, most importantly, costume galleries as biologically possible. It'll be like you're at comic-con, minus the huge crowds and Slave Leia dance contests. Kevin Polowy, NextMovie and Film.com editor and resident DJ, is eager to trek to 2012 Comic-Con to see how Martin Freeman and friends measure up to Hobbits past (get it? Short joke), hear how many times Quentin Tarantino uses the word "awesome" over the course of the one-hour "Django Unchained" panel (over/under: 16), and once again gorge on those disgustingly delicious Mexican eggrolls at that one place on 1st Ave (Mexican eggrolls!). Rob Keyes from Screen Rant is anxious to see the year's two biggest panels happening on Saturday in Hall H where we all hope to get our first real look at Guillermo del Toro's Pacific Rim and Zack Snyder's Man of Steel. Those two films combined with The Hobbit and a potential presentation about Godzilla make that the panel to be at. On the Disney/Marvel side, the Iron Man 3 presentation also has a chance to steal the show if President Kevin Feige comes prepared to lay down major announcements regarding "Phase 2" of the Marvel cinematic universe. Bring us some Ant-Man, Black Panther and Guardians of the Galaxy! And there you have it! The whirl of excitement is almost upon us. Will Tarantino and del Toro stage an impromptu smack-talk battle? You'll know as soon as we do.